Daisy Perez Jep's story is heartbreaking and all too common in the developing world. After political elections took place in Kenya in 2008, Post-Election-Violence (PEV) broke out between tribes who felt slighted by the results of the election and the police force representing the government. On the night of December 31, 2008, Daisy was literally caught in crossfire. Her house in Nairobi was in the middle of a street where a shoot-out occurred between the police and a tribal group. She tried to leave with her sister, so that she could safely remove her two children from the violence. However, she was struck in the leg by an errant bullet, and lost consciousness not knowing whether her family would be okay, or if she would survive the ordeal. Daisy awoke almost two days later, with a saline drip in her arm, in the middle of a blood transfusion. Her leg was severely wounded from the bullet, and slow medical care caused her foot to become infected. Once it became clear that the infection was spreading, her leg was amputated. For six months, Daisy wore a single-axis Jaipur Knee, but had difficulty taking care of her family with her limited mobility. Her husband left her because of her amputation and she was also unable to return to school, where she had been an excellent student prior to her amputation. 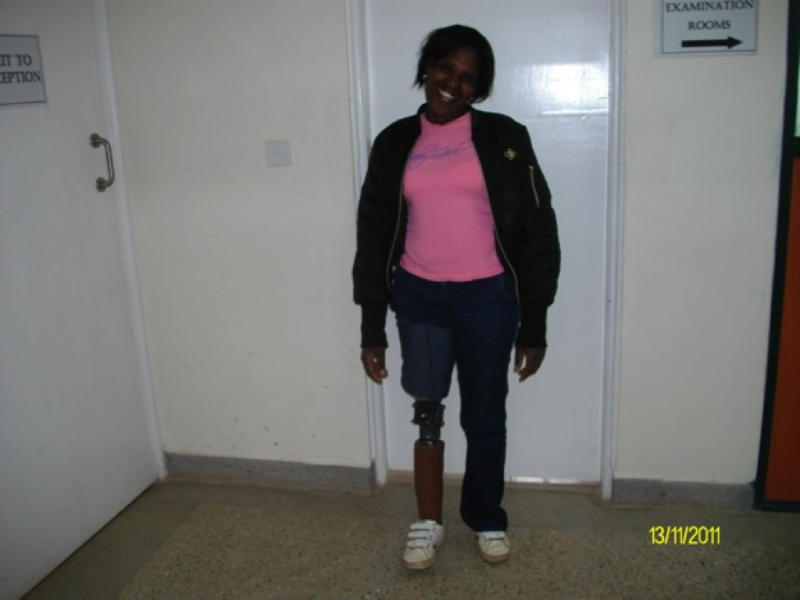 She was given new hope in October of 2009 when she was fitted with the LIMBS Knee. UPDATE: The increased mobility of the knee joint has allowed Daisy to once again effectively care for her family, and also has also allowed for her to return to school. She got her diploma in Human Resources and Management in July 2011. Despite the hardship in her life, LIMBS has helped Daisy gain a second chance at an education and a better life, by providing her with the ability to walk again.